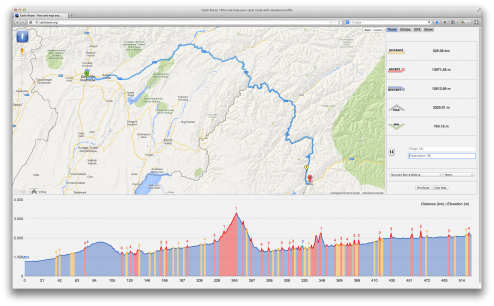 Working on a cycling route through the Middle East for this summer and wondering about the elevation profiles of the challenging Pamir Highway, I ran into Cycleroute.org. Cycleroute.org uses the Google Maps API Elevation Service to provide elevation profile of cycle routes. Just enter a starting point and a destination into the interface and a suggested ‘bicycle route’ is displayed on the map. The interactive elevation profile of the route is displayed beneath the map. Cycleroute.org highlights the top five steepest climbs on the route. 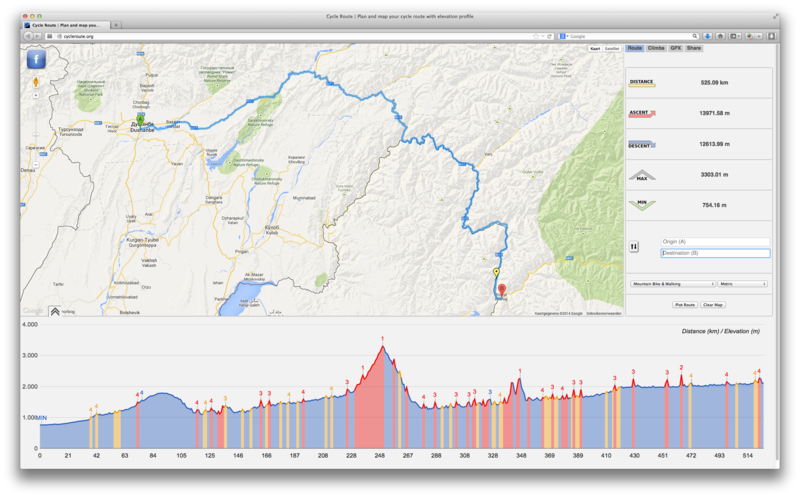 You can mouse-over the elevation profile to view where the climbs on the route you created are located on the map. By selecting the ‘climbs and visualization’ tab in the map side-panel, you can also view the distance and grade of the steepest climbs. It works a little faster than Google Earth.